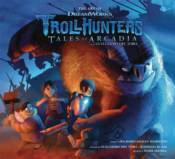 Dark Horse Books and DreamWorks Animation are pleased to present the definitive chronicle of the making of Trollhunters. Including hundreds of pieces of concept art and creator commentary from Guillermo del Toro and the talented minds behind the Emmy� Award-winning animated series! o The art from the hit Netflix series! o Featuring over 200 pages of concept art and notes from the art team. o Includes a foreword by Guillermo del Toro, an introduction from Marc Guggenheim, and an afterword by Mark Hamill.